My baby girl went to camp this morning. This is her second year going. Last year we had to go over the list a few times and I helped her get all packed up and she was just a bit afraid of going. THIS year? She opened the letter with the list herself and I never saw it again. She's been packed for a month. A MONTH. Seriously. This morning she got up at 6:00 and made her own sack lunch and loaded up all her stuff in the car. I heard a noise at 6:30 and got up and it was her with her little carry on bag on her back. I told her it wasn't even time to get up yet!! And went back to bed. Two hours later we were on our way. She insisted that she HAD to have McDonald's for breakfast. So we hit the drive through and got to the drop off point right on time. 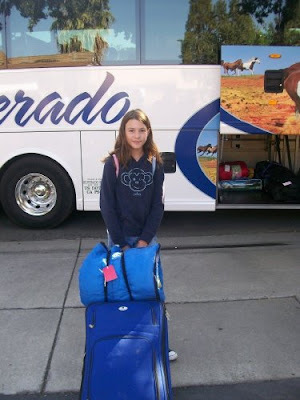 She was just a tiny bit nervous when we were waiting for it to be time to load the bus. Then she gave me a big hug and ran and got on. I'll see her on Friday!! Oh my... she's growing up! I hate that. :o) Hope she has fun though! I love camp! Can't wait to send my kidlets!!! I keep coming up with more people I need bookmarks for. They make great little gifts. I know I'll definitely need a "japanese" themed one later on down the road. I'm just hooked on these bookmarks. Oh man, I remember I was the same way when it was time for girls camp. I couldn't sleep the night before! I wish my kids got to do stuff like that...we are crappy parents! LOL she looks so much older this year. Hope she has a great time! Sleepaway camp is a great thing. Aww, don't you just love when kids are so excited that they get things ready themselves? Me, I'd have my kids packed already, be dragging them out of bed..(they'd be telling ME.."it's not even time to get up yet") and I'd have them dropped off at the pick up site faster than you know. I'd miss my babies too. Hope she had a good time!